Lady criminologist, Miss Emma Wallingford, unknowingly finds herself tangled in the dangerous mission of Lord Derick Aveline, a spy who also happens to be her long lost first love. But when deception is the name of the game, no one can be trusted. And every love--and every life--is at risk. Though Sweet Deception can very well be read as a standalone (there are just a few mentions of the previous novel’s couple to make a loose connection between the books of the series, but nothing major that you need to know prior to starting Sweet Deception), I still think you shouldn’t miss out on Sweet Enemy as it is such a delightful story. The barrage of today’s revelations was almost too much for her to bear. So many pieces, memories, and thoughts seemed to make a new kind of sense now and yet make no sense at all. It was as if she’d been looking at Derick through a kaleidoscope that blurred his edges, but it hadn’t mattered because he’d been such a beautiful, dazzling thing. But now, with a turn of the wrist, the lenses had aligned and he’d come suddenly into sharp, stark view with all of his faults on display. And she found him even more beautiful. 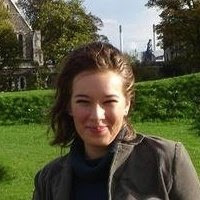 Emma is a delightful heroine, I loved how besides her intelligent scientific mind (she is a brilliant mathematician and a female criminal profiler! and she made up an equation as her plan for making Derek fall in love with her: S (A + B + C) = D²) she had such a naïve and optimistic outlook on life, and the way she jumbled up common sayings and proverbs made her human and so lovable (she reminded me a lot of dr. Temperence Brennan aka as Bones from the TV series, although Emma is never aloof or cold, she is approachable, compassionate and very loving). And Derick… oh Derick. Derick (short for Lord Frederick Aveline, Viscount Scarsdale) was a great hero. I found it impressive how despite him being a tortured hero with a bleak outlook on life, he wasn’t a depressing character: he had so much life, energy and passion that it livened up the dark outlook he forced himself to adopt. It was moving to see the way Emma unraveled him layer by layer and got under his skin despite Derick’s declarations and objections. His attraction, passion, tender feelings and love for Emma progressed beautifully and when he finally realized the depth of his emotions for her, it was humbling. These two’s romance was beautiful and worth telling alongside Liliana and Geoffrey’s (the heroine and hero of Sweet Enemy). “Poor darling,” he murmured. “You have no idea how desirable you are, do you?” Her eyes squinted her disbelief, but never left his. By God, he wasn’t letting her off of his lap until she was convinced. “When I first saw you again, Emma, you . . .” He struggled for the right word. “You captured me. You’ve grown into the kind of woman men fantasize about.” Emma snorted. “Oh, don’t doubt it.” He unlaced his fingers, bringing one hand to her face. “Your lips are full, yet delicately bowed.” He gently rubbed his thumb across them and they parted on a breathy intake.“They beg to be kissed.” He cupped her face more fully, his thumb continuing its foray. “Your cheekbones are high and strong, your nose pert and adorable and your eyes . . . Your eyes, Emma, swim with a thousand different thoughts, secrets, memories.” He lost himself in their amber depths for a long moment before murmuring, “When a man looks into them he wants to dive in and explore. Stay a while.” Stay forever. 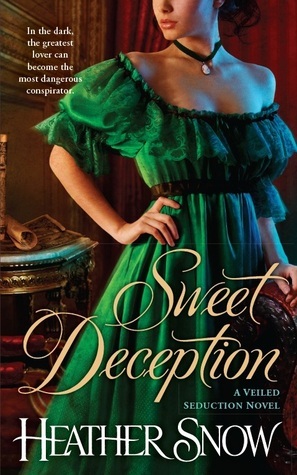 Verdict: Sweet Deception was a fantastic addition to the Veiled Seduction trilogy. With a scientist heroine and a dark hero, murders and investigations, mystery and romance, it had everything to keep the reader’s heart rate racing, either due to the intrigue or the sensual romantic storyline.